Fukui is a prefecture facing the Japan Sea and has Awara-Onsen Hot Spring that has a long history since 1883. A lot of academic or artistic people have loved this hot spring. Also this hot spring is selected as one of 100 famous hot springs in Japan by hot spring therapists. This place has good hot spring and many long-established stores where provide delicious cuisine with fresh seafood. This article will introduce you to 5 hotels where you can get real break! Hokuriku Awaea-Onsen Hot Spring “Mimatsu” is a hotel that has as much as 36 rooms with open-air bath, which is the largest number of rooms on the Sea of Japan coast area. In the large public bath “Meigetsu Den” of the shape of moon, or domed large public bath “Taiyo Den” which opens the ceiling depending on seasons and time, you can have a great time relaxing in the hot spring and having a fine view of all seasons. And also this hotel has a traditional Japanese landscape garden with very Japanese pond with a red bridge. You can enjoy great view that changes the scenery in each season. When it comes to cuisine, this hotel provide dainty and refined Japanese dishes with fresh seasonal ingredients such as crab, abalone and raw fish, witch you can eat only in Fukui. One of their specialties “grilled mackerel sushi” will make you feel so satisfied. They also have game room, karaoke, connecting-room with two rooms, smoking-free rooms, barrier-free rooms, meal served in room. It takes 15-minutes on foot from the hotel to Yukemuri-yokocho, where you can enjoy the good atmosphere that Japan used to have. If you want to visit beautiful “Toujimbo”, it takes 15 minutes by car. To go to “Eiheiji temple”, it’s 50 minutes by car. Of course, just chilling in your room is another good way to spend time in this hotel. *Free pick up is available with conditions. Check out the details at the official web site below. Awara onsen “Seifuso” has a long history for 60 years. The 80㎡ open-air bath with garden is their attraction and known for one of the biggest open-air bath in Hokuriku region. This hotel opens for 24 hours. Even a couple enjoy hot spring together at an ashiyu, a Japanese public bath in which you can bathe your feet. You don’t even need to take off your clothes there. A rare bath made of chinaware is also their another attraction. They provide 3 kinds of rooms with an open-air bath and 3 kinds of Japanese style rooms without an open-air bath. You can choose your dinner from dainty and refined Japanese dishes or buffet style dinner with over 50 kinds of meals that change depending on the season. Although it takes buffet style, each table is separated and other people won’t disturb you. You can also reserve a private bath. They also provide pay massage and Karaoke. This hotel has an adjoining local souvenir shop, free shuttle bus from the station with conditions, free Wi-Fi, free Yukata for inside of the hotel. Their front desk opens for 24 hours. The location is also so convenient and has received favorable reviews. It takes only 1-minute on foot from Aewra-Yunomachi station, and 15 minutes by car from the hotel to Shibamasa-World, Toujimbo, Echizen-Matsushima aquarium. Grandia Housen is a Japanese and Western style hotel that was certified as a five-star hotel in 2016. You can enjoy every bit of Japanese “Omotenashi*”there. They take pride in various 33 rooms with open-air bath. Their special room “Bettei” or “Hanare”, witch means different buildings in the same premises, has more luxurious and relaxing atmosphere. Especially in “Tenjou-no Spa”, which was renewed in 2017 and has a fine view, you can enjoy soft and smooth Awara hot spring. They provide Japanese style breakfast, dainty and refined local Japanese dishes of the seasons, pay massage service, pay karaoke, footbath, free program of making a soft-boiled egg by hot spring, and free Wi-Fi over the hotel. There is a traditional Japanese landscape garden just in front of the hotel. They light up “Tsukimi-Dai”, a part of the garden, at night and many people come to take a commemorative photos. It takes 20-minute by car from the hotel to a touristic place “Toujimbo”, and 15-minutes to “Shibamasa-World”. The convenient location is one of their attractions. *Omotenashi: a Japanese word, which has several meanings; “hospitality”, “treatment”, “service”, “welcomeness”, “reception” and “entertainment”. Hotel Yagi was founded in 1883. This hotel is famous for having 4 hot spring sources and natural buffet restaurant. The large public bath with an ample supply of water is available for 24 hours. 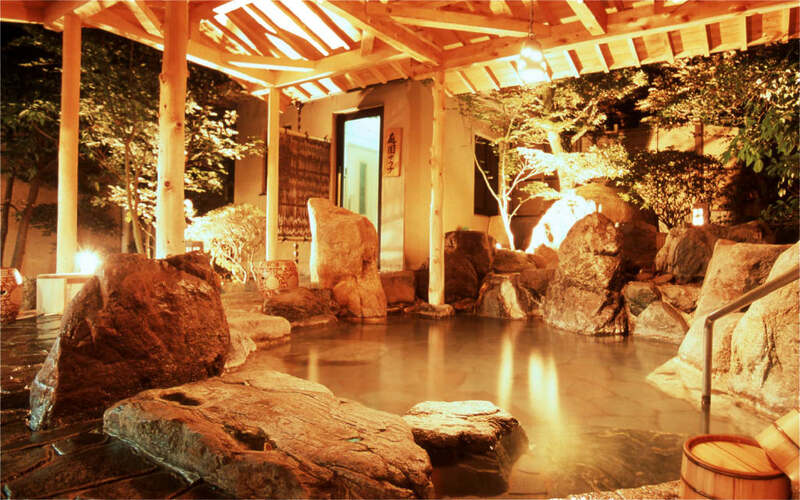 If you reserve a private open-air bath in the garden, you can enjoy the hot spring without worrying about public exposure, although there is a charge for it. A traditional Japanese landscape garden will be illuminated at night and from the restaurant you can enjoy cuisine and the landscape at once. From every table of the restaurant, you can see the garden. They use fresh vegetables and fruits for their cuisine. All foods are handmade and they are without additives. You can enjoy the cuisine of the seasons in a relax atmosphere. Vegetable morning buffet, sauna and free self-service drink are also available. You can choose your room from Japanese-Western style room where you can stay by yourself, to bigger Japanese style room where you can stay with your friends or family. This hotel will be a good choice for natural-oriented people. *Free pick up is available with conditions. Check out the details at the official web site. Hama-U is a seaside hotel by the Japan Sea. It takes 5 minutes from Hama-U to the beach. They are proud of the hot spring where you can have a grand view of the sea. The soft and smooth hot water is known as “hot spring of beauty” which makes your skin smoother. The scenery of sunset and lamplights of boats on the sea is very fantastic. They offer delicious dishes witch makes the most of the original taste of local ingredients such as organic vegetables and fresh seafood from Echizen coast that has a fishing ground of Japan Sea. In this hotel, you don’t need have slippers on, because this hotel furnished all of floor with tatami mat including the lobby, corridors and even elevators. Walking barefoot will make you feel relaxed. This hotel has large public bath for24 hours, pay private baths, a bar, a banqueting hall, pay karaoke, icemakers, space for kids, massage chair, bouncer and so on. Even if you come with kids, you can enjoy your stay. Although it is not free of charge, you can reserve some activities such as golf, fishing, ceramic art and making buckwheat noodles. 40-minutes from Takefu Station Mae to Naka-Mobara (bus: Fukui Tetsudo Takefu-Echizen Coast Line) This hotel is not so far even on foot. 1-hour and 35-minutes from Komatsu airport.